Humanity is waking from aeons of isolation and disconnection, progressively rediscovering his multidimensional place in the wider Universe. 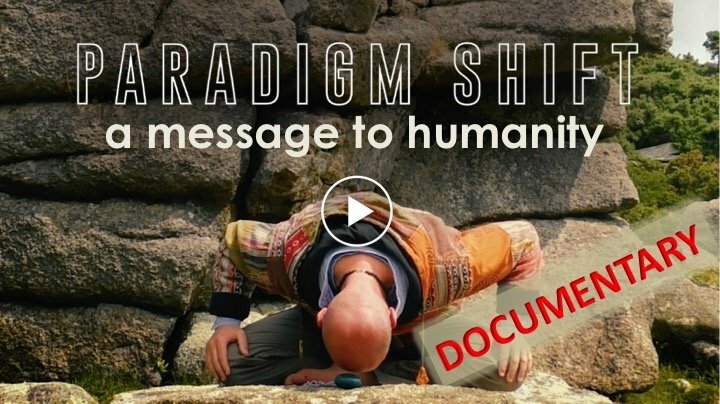 It's a great sign, and completely necessary to be a part of The Shift into the New 5D Paradigm. Many veils need to fall, that have obscurred the complexity of the reality we're engaged within, ones that interrelate existentially with human karma. It's clear, mankind did not evolve naturally from the apes, and is not alone within the multidimensional landscape here on earth. 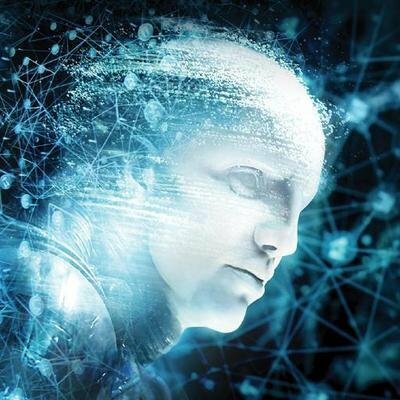 In fact, in many ways, Homo Sapiens has been an experiment - a slave species - to a more advanced alien intelligence, that he is now emerging from, unwinding out of. Awareness is the key. What you fearlessly bring your awareness into, explodes the ties that bind and limit. It is with this courageous approach, that we must dig deep through the internal intervention of the "Reptilian" energies concealed within. We must confront and realign them. I incarnated here somewhat unusually as a soul-exchange, what some would call a 'walk-in'. 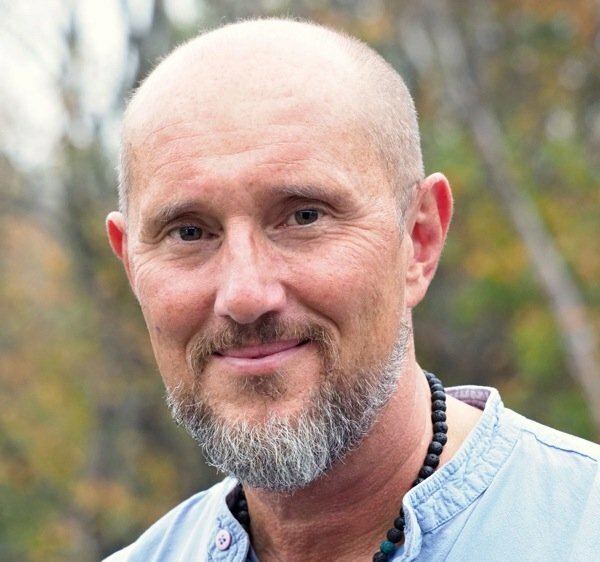 Even though like everyone else I was submerged quickly into the complexity of this density, nevertheless, I was at a point on my journey where I was able to retain the connection to the higher dimensional home that I know. Crucially, even though the various obscurrations of consciousness here are very intense and disconnecting, deceptive and controlling, I was able to keep righting myself in the interdimensional confusion. The downgrading constraining influence was quite shocking, and non more so than what I have since come to know as the Reptilian Energies here on Earth - an ancient species that arrived here long before the emergence of mankind, and whose very DNA has been enfolded into the Human genome. When you look into the coding, and especially the chromosome count, it's clear that Homo Sapiens is a Hybrid species, one that has been purposefully adapted to receive interdimensional influences of supression and enslavement. I've since had many direct encounters with these entities in the field, the most poignant of which, taking place near a crop circle (image left) in the mystical location of Avebury, UK, a few years back. 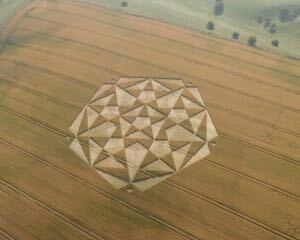 Having visited the crop circle during the day, I was intuitively guided back there later that evening to camp in a small secluded valley which had spiked strongly in my awareness. My higher dimensional team made it clear it was for 'educational' purposes (thanks guys!). It was a clear night, the stars twinkling brightly overhead, and pretty much immediately the hairs on the back of my neck were tingling with the anticipation of something paranormal about to take place. In a nearby field, a combine harvestor was still working with searching headlights. Suddenly, I could feel a dense energy sweep over me, immensely constraining, focussed and powerful, you could say fearful, although these days on my journey I'm at a place to realise that fear is a gateway to greater awareness, greater soul soveriegnty and therefore one to turn directly into. Within a short space of time, I felt like I'd lost control of my mind. A consciousness has invaded it and taken over. Although one could easily be overwhelmed by this, personally, as a being, I don't identify with lower mind; it is merely a vehicle through which to experience a particular density. The curious thing being in this case, that I had lost control of the driving wheel. How did that happen? I wondered. Suddenly, I'm seeing the combine harvestor from the nearby field directly in my line and moving inexorably toward where I was camping. The sense was it had been purposefully commandered in my direction. My body was locked and unable to move. The combine harvestor approached ever closer and my perception was that I would be chewed up by it. I was physically paralysed, unable to move or shout. The only thing to do now was to surrender, deeply into the inevitability of the Universe. All vestiges of fear and control vapourised at that point. If this was to be my passing on, so be it. Miraculously, with acceptance and realisation, the imagery of the harvestor vanished as a disappearing desert mirage, and the sovereignty of mind and body returned. I realised it had been a controlling projection, planted in my mind so as to subvert and bring under control. I would say this is a Reptilian phenomenon for all to hoist on board - their ability to project into one's mind a reality construct that controls by the activation of fear. This includes some of the more grotesque and overpowering imagery that's been created of their form - it's a self serving projection designed to exert power that we must each be wary of. The mirage did not work. Fear is always an opportunity to be confronted. As the images vapourised, from the corner of my inner eye, I caught faint glimpses of the perputrators - a hive of entities, that you could say had faint lizard like characteristics. Altough this was the first time I'd encountered the phenomenal Reptilian power of a close proximity 'hive' (which works by implanting fearful illusion designed to cause the soul to disempower itself), over the years, I've had plenty of encounters with singular ones. 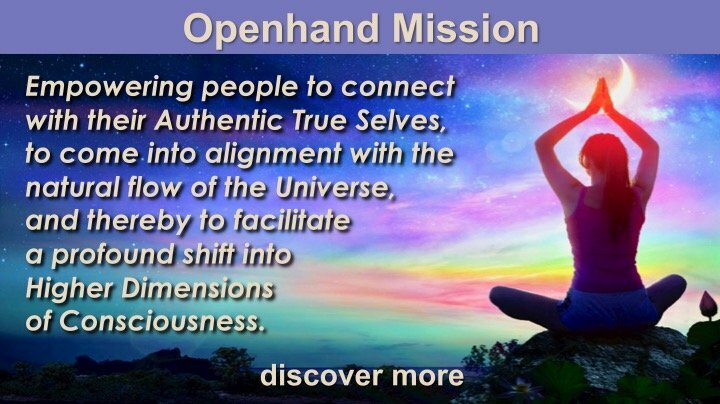 In the work that I do with Openhand (see The 5D Shift Project), it's my purpose to empathically connect with people in meditation, to catalyse integration and realignment of souls, so as to take part in the unfolding 5D Shift. Pretty much immediately, when someone sits in my field, I'm able to feel and diagnose the various convolutions of consciousness happening within them. In this way, my first encounters with individual Reptilian Entities were as a curious bloating feeling that many people seemed to have in the gut. Once activated through meditation, the bloating feeling would take on more of a separated form, begin to squirm, and move around. Although physical in nature, it was clearly of a different freqeuncy to the human physical. So a sentient energy worker would feel it, but not necessarily see it. And you'd need to be able to be exanded into the interconnectivity of the field itself, rather than locate it with some physical medical device. Despite this, it was abundantly clear the sentience had a physical existence of its own. 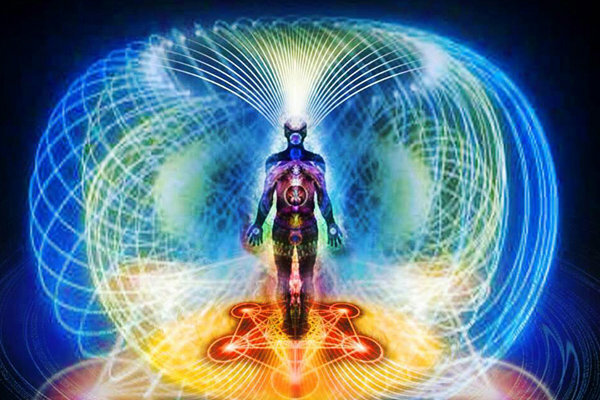 My consciousness works as a toroidal field (as it does for everyone when consciously activated), within which, the entities would begin to move, either ascending or descending depending on their acquiescence to the realigning flow. Entities that were ready to let go and rejoin the universal fold, would begin to ascend initially into the angellic realm of the 4D. But this process was not immediately straightforwards. Each enttiy seemed to have a tether - a tentacle - that went up the spine and wrapped itself either around the throat chakra or the head of their host. These I discovered existed in pretty much all people, although they'd sunken like white noise into the background of their experience. Hence they were having a strongly controlling effect on the being, whilst remaining invisible. I came to realise this was the energy that is precipitating such extreme consumption on the planet. Even though humanity is becoming increasingly aware of the destructive effects of society, the underlying controlling energies of excessive consumption, through this alien species, persist. It was clear to me that something fundamental needed to be resolved in the field. The answer came fairly quickly after the first several encounters. I knew realignment was the key. The entities did not belong here, their vibration was not comensurate with the natural frequency of the planet and certainly not with the Shift to the higher 5D paradigm of mutual respect and inconditional love for all life. With support from the benevolent mission facilitating The Shift, the realisation dawned they would need to be relocated with their origins from whence they'd traveled. Shortly after I was sitting with a group during an Openhand retreat, where I could feel several of these entities beginning to activate from people's compressed inner fields. 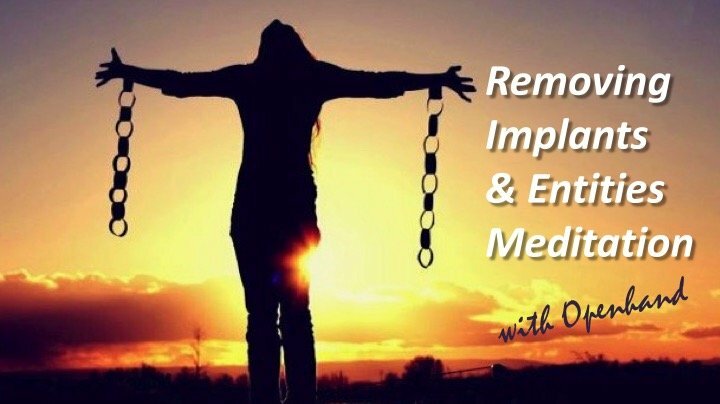 I was working to release those that were activating and acquiescent to surrender into the 4D (in more recent times, I've witnessed an increased readiness to do this - I believe because they anticipate the dramatic impact of the Earth Shift Completion). At some point, a portal in the field opened, upon which I could feel the connection to an incredibly dense energy, but one that was also extremely congruent, and felt like it had benevolent intent. The film Prometheus (which I warn you is pretty full on) contains other clues to the way forwards. To me, it contains a (quite grotesque) metaphoric depiction of the Reptilian entities and how the energy is all consuming, including their own Draconian fore-father. It became clear to me that the Draconians were now ready to reclaim their wayward offspring through portals opening in this Great Realignment on Earth. 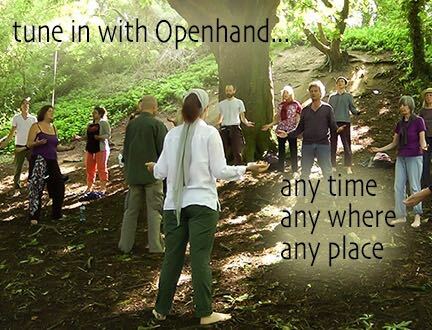 From that point on, during Openhand Events, it became largely straightforwards to open the portal and relocate any activating Reptilian Entities in people's fields. Many were willing and ready to make the shift, which I found deeply encouraging. For energy workers interested in opening portals to the benevolent Draconian ancestors, I've found the volcanic stone Obsidian a good way to form a bridge - they seem to be able to resonate on its frequency. No doubt there are other volcanic rocks that do the same. I think it's also essential not to polarise and demonise the Reptilian Entities. Because they perform an invaluable universal role - in that they secure and animate dense physicality; they bind a construct so that life can be experienced in that frequency. You can only bring light to something by immersing yourself in it. By its very nature, separation consciousness is designed to produce the relativistic experience. Countless life forms are working through these densities back to the light, including humanity himself. 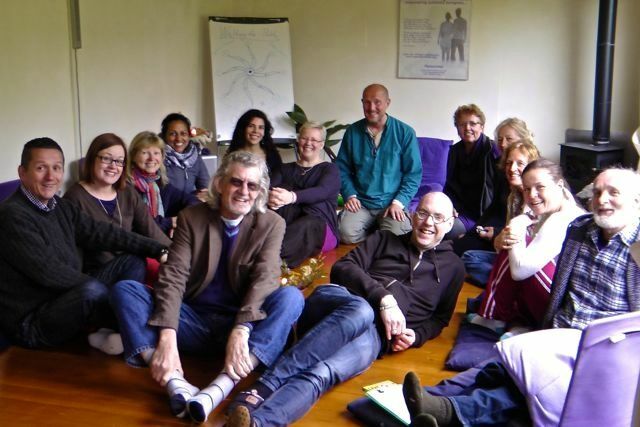 Realignment is the key, bringing them back into the universal fold. If you merely try to castigate, you simply perpetuate the cycle of struggle and conflict, including self limiting judgment. In any case, we need to realise how we manifested them as an external actualisation of inner configurations of consciousness. In their aligned form, Reptilians have many tremendous qualities, and the way to let them go from within, is to isolate their embodied characteristics, and work to realign those aspects of yourself. That way, the distorted energy cannot persist. 1) archetypal survivors/warriors - with a paramount will to succeed and thrive. 2) unquestioning loyalty to their own kind and strong team builders. 3) deep respect for skill, strength and proved ability to endure. 4) tremendous coherency of being and commitment to their cause. 5) resilient, courageous and strongly focussed. 6) highly connected into the consciousness of the surrounding field - the 'gut instinct'. 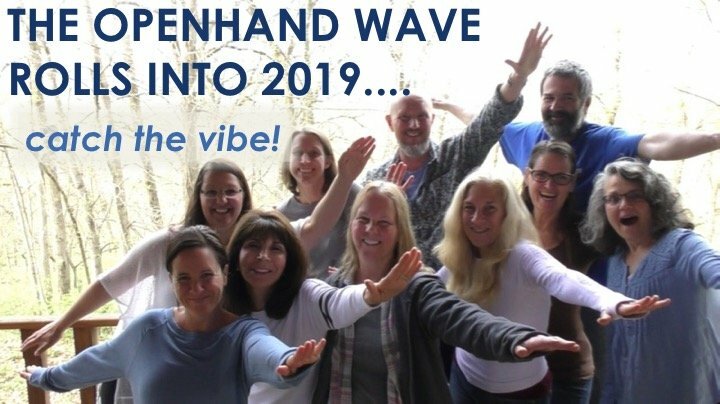 So, as energy workers and divine servants of The Shift, we can work to embody the aligned qualities of these behaviourisms to our advantage, and in the greater service to the realignment of life. In fact you already witness many of these qualities in some of the world's best known motivational speakers, strong 'spiritual' teachers and business leaders. We just need to be careful how the energy is being applied and that it's in the selfless interests of all life. Unforunately, at the moment, it's still often coming across in quite distorted form. One key aspect of realigning this consciousness, is in how we consume, and especially within the diet. If you're still consuming meat and dairy, especially that which has been produced within the disrespectful industrial food chain, then you're unwittingly embodying the fearful energy which the distorted raptor consciousness feeds off and persists within. So switching to a more alkaline, plant-based diet and realigning your gut microbiotics accordingly, will greatly increase consciousness in the gut and detach any embedded entity. I distinctly recall a week long fast to release embedded, colonic, mucoid plaque (which most adult humans who've eaten plenty of meat and dairy have), which when released, literally felt as if energetic claws were being removed from my abdomen - it was a palpable unwinding from the matrix field. You also need to carefully consider aligning behaviourisms within physical exercise and sexual intimacy - essentially any deeply physical activity where conditioning leads to blindspots of unconsciousness. I call the process 'Healing the Wounded Dragon'. Essentially because you're realigning the raptor energy within yourself, thereby ejecting any Reptilian entity in your field, and then greatly benefitting in life from the aligned 'dragon' energy. It can help you mediate successfully through the physical densities on earth. I've included more advice and recommendation in the concluding video "Healing the Wounded Dragon". 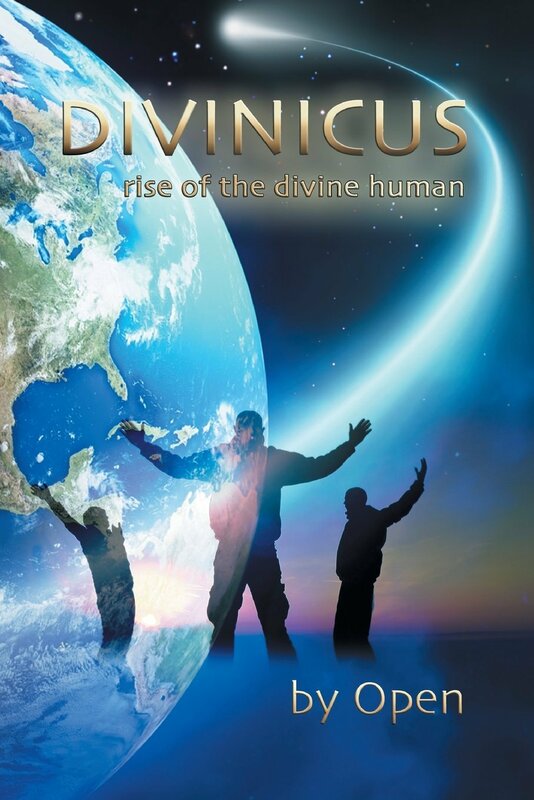 Humanity is now reawakening to his multidimensional place in the Universe. But this is by far an easy birthing process. There have been many convolutions and interventions throughout human history. Homo Sapiens has been an experiment to create an enslaved species for the purpose of propogating across the earth and exploiting the natural resources here, including his very own genetics. Benevolence was never going to sit idly by and let this happen. But neither would it demonise and castigate those that had been so unconscious in their explotation. To unfold a Universe of mutual respect for all life existing in nirvana, ALL aspects must be encouraged into harmonious alignment. The solution is the PARADIGM SHIFT into the 5D. Those convoluted energies that do not belong here will either be relocated and healed or else broken apart through the galactic core - a universal cleansing mechanism. The Reptilians and Draconian entities have powerful qualities that we can each benefit from - that unshakeable will to persist in the face of adversity for example. But it must be a will that empowers ALL life, not just one aspect of it. Your experiences of raptor consciousness? No one has commented on this one yet - which I can understand, it takes a lot to digest and probably pushes a few buttons. My purpose in sharing is to normalise in it and then equalise with it. In so doing the energy no longer holds you or defines in any way who you are. When we move beyond fear, with acceptance of what is, then it becomes tremendously empowering. So what are your experiences of this 'raptor consciousness'? I'll be happy to offer a reflection. As I am reading this article, i reflect and can find the aligned aspects of draco consciousness in my own field. They are very powerful indeed and of great benefit when working within dense energy environment of matrix and even mainstream spiritual. It is respected and noticed by people! The key is finding balance so that the dense energy at physical, emotional and mental planes does not overwhelm and distract which I noticed is happening in my case as even during meditation becomes challenging to stay clear in mental plane. And as I am writing this, I can feel the energy movements around my throat and mostly head. Mostly, I can feel the density closer to top of my head - similar to what you described possibly. I am going to get Obsidian stone to help me work with this dense energy. Recently, bowel movements have been mostly loose. Maybe, there is a clearing going at the same time. Great article and thank you for the reminder!